My desk, which lately has felt like my home away from home — if not for the fact that it’s inside my home. 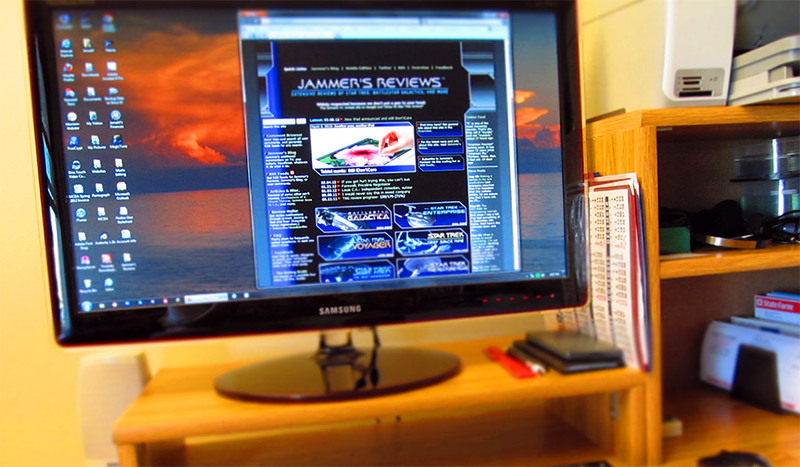 Based on how long it’s been since I’ve posted any new TNG reviews, one might assume that I am neglecting Jammer’s Reviews, my longest-running website project. Far from it. I’ve been working hard on a behind-the-scenes upgrade to the website, which is necessary from time to time. The last major upgrade was in 2007. This upgrade marks the sixth generation of the site. I’ve created at least one new feature which should be of use to the active commenters who frequent the site. Learn much more about this upgrade here. As much as I’d like to see the final TNG episodes here, I understand your wish to update your site. I believe anybody who has finished something personally important to be published (like an oil-on-canvas painting for sale, a self-written novel or a PhD thesis) can tell that there is no satisfaction in this before you can say there is nothing that needs to be improved. Of course, I am looking forward to reading your final reviews. But quality cannot be achieved by pushing, and quality is what made me a fan of jammersreviews.com. Not a bad idea in theory, but in practice it’s very time consuming, and while it might be useful as a reader feature, there is no benefit for me in putting in the extra time, as it would direct people off my site rather than to other pages on it. I actually meant to bring up the hits on your site, not off–for example, if you click on a comment author, all the comments bearing his name pop up. It would be great (when, for example, you mention a particular director’s work as being “consistent” or “surprising”) to bring up a list of the episodes which you’ve reviewed, on your site, on which he/she worked. Time-consuming though, is the magic word–maybe it’s a project for another summer…thanks for the feedback. The comments are easily searched by author or content because they are all in a database that is structured around very specific criteria. The reviews aren’t really set up that way. To do what you describe would require the creation of a database that I can’t even comprehend right now, populated with all kinds of different types of topics like directors, actors, writers, etc., and then I’d have to go through some 900 articles and link up all the references of everything relevant to that database, which I wouldn’t even know how to build. It’s just not feasible, I’m afraid. Jammer, I know that’s you don’t like Babylon 5 (and its spin offs), but some of TOS veterans (D.C. Fontana for example) working on them. New Voyages/Phase 2 deserving to be reviewed too. And what about very “trekkish” novels – Star Wolf sequence by David Gerrold, and Robert J. Sawyer’s (yes, that “Boarding the Enterprise”‘ guy) Starplex? Whatever… Thanks for your site very much!